This distinctive, slightly sweet chili sauce is ideal with chicken as well as seafood, vegetable dishes and as a dipping sauce for spring rolls & dim sum. Recently someone told us that they mix a few tablespoons into freshly-made popcorn! 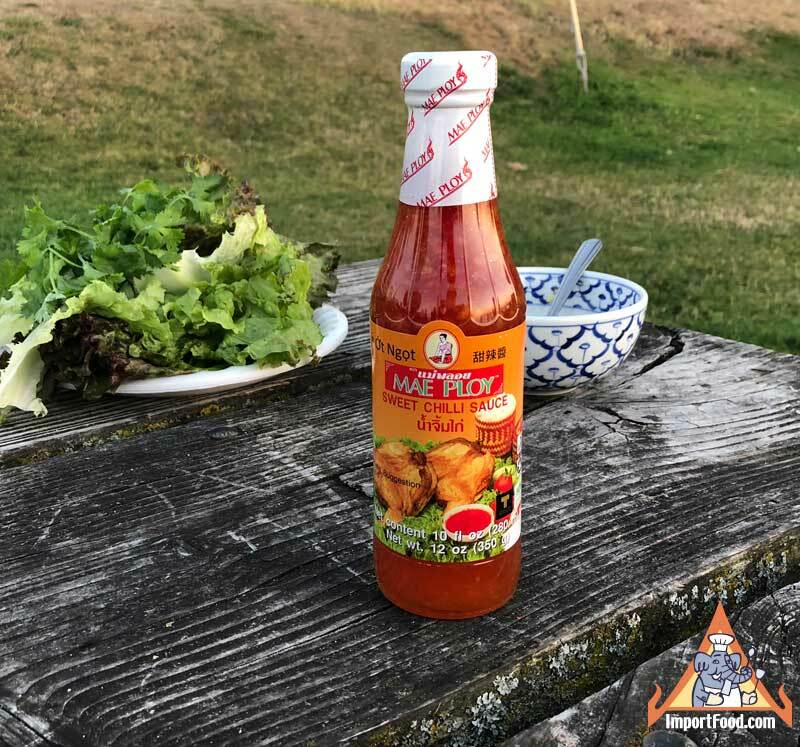 Mae Ploy is a fairly thick sauce, and if you've ever purchased barbeque chicken from a street vendor in Thailand, it was undoubtedly served with this sauce. Packed in a nice glass bottle (large and small). Ingredients: sugar, water, pickled red chilli, vinegar, garlic, salt, xanthan gum. No preservatives and no artificial coloring. Product of Thailand. Mrs Kennedy Loves This Sauce. If it satisfies the refined taste of Mrs Kennedy you too might like our Mae Ploy sweet chile sauce. 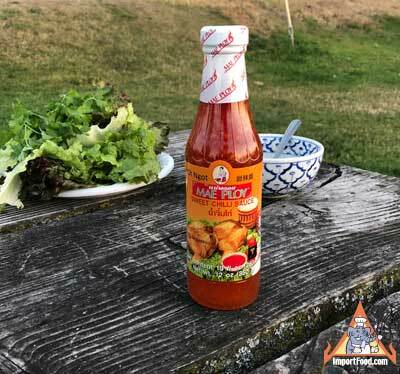 I have been using Mae Ploy Sweet Chili Sauce for years while guiding in rivers in Alaska. I cook fresh salmon right on the river and my clients have raved about this sauce. So far, 25 Chefs and numerous clients from all over the world now use this sauce in their recipes. Thanks alot for making it available to me, as I had a hard time locating this item, once I was introduced to it. Thai chicken stir-fried with green curry, "Gai Pad Khiaowan"
Spicy Fish Cakes, "Tod Man Pla"
There are pictures below shared by visitors to this website, links to street vendor videos, and detailed instructions on how to prepare three of our own versions. Perhaps the most famous gai yang is sold by vendors in the seaside community of Bang Saen, where the bird is cut open along the belly, flattened with a few blows from the back of a cleaver, and pegged with a stick to hold it, then marinaded and grilled over charcoal. Can be eaten as a starter or as a snack on their own. They are also served as a side dish with a larger Thai dinner. This is an example of the popular 'fried curry' style that produces a dry result. It blends equally well with rice or noodles.